MultiBrief: Are USDA’s changes to school lunches needed? Changes are coming again to school lunches. 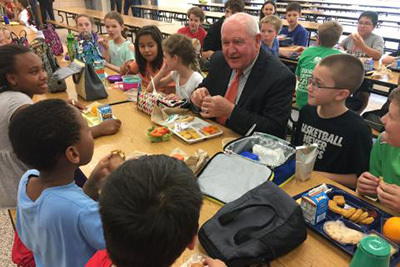 Agriculture Secretary Sonny Perdue announced last month that the department is taking steps to roll back lunch standards promoted by former first lady Michelle Obama. Perdue's interim final rule will give schools more flexibility in meeting whole grain and lower sodium requirements, and it allows schools to serve 1 percent flavored milk rather than skim. The rollback gives more local control to states and comes after feedback from students, school and food service experts, including the School Nutrition Association, which lobbied for the new flexibilities. But some school nutrition experts question whether the changes are necessary. The changes will undo some parts of the Healthy Hunger-Free Kids Act, signed into law by former President Barack Obama in 2010. It was implemented in districts across the county beginning in the 2012-13 school year. Under the Obama-era rules, some kids weren't eating the food, so it ended up in the trash, Perdue said as part of the announcement. Many states have also reported a decline in school lunch participation, according to the USDA. However, a 2016 study by The Pew Charitable Trusts found that 84 percent of nutrition program directors in three states reported stable or rising revenue in the past year. Some may remember the #thanksmichelleobamba hashtag on Twitter that surfaced in 2014, when students posted photos of unappetizing lunchtime meals. Those photos may not tell the whole story, said Stephanie Joyce, national nutrition advisor for the Alliance for a Healthier Generation. Schools are required to offer students a whole grain, fruit, vegetable, milk and meat (or meat alternative). But students have the option to take only three of those five components. "It's not showing the complete reimbursable meal kids could take," Joyce said of the Twitter photos. "I just don't feel like it's an accurate reflection of what's actually happening." Joyce, who worked as a school nutrition director for a Maine district during the time of the 2012 rules implementation, said the district didn't see an increase in food going to waste. In any district, there will be some plate waste regardless of what schools are serving, she said. Students may have to try a new food item between 10 and 20 times before deciding they'll eat it, Joyce said. "It just takes a school year for kids to accept these new foods," she said. Under the Obama-era regulations, schools had been required to meet the lower-salt Sodium Target 2. Now, schools that meet Sodium Target 1 will be considered compliant until 2020. That timeframe will give schools more time to create foods with the appropriate amount of sodium. The USDA will work on implementing a long-term solution during that time, according to the department. Additionally, school are still required to serve 100 percent whole grain products, as implemented by Obama, but the USDA will now grant exemptions to states experiencing hardship in serving 100 percent whole grains for the 2017-18 school year. Linette Dodson, director of school nutrition at the Carrollton City School District in Carrollton, Georgia, said her district saw a positive response to most of the new meals served under the Obama-era rules. Her district started removing sodium from its foods in the mid-2000s, before most schools were doing so, and has worked to improve the flavor of its food ever since. "A few years ago we added flavor stations to let kids to add seasoning to their food if they wanted it spicier, or more of a certain seasoning," Dodson said. But the district didn't initially receive positive feedback from students on some whole grain foods when they began serving all whole grain products in 2012. More recently, manufacturers have begun to provide foods that are more palatable and better looking, which has helped increase students' acceptance of them. "They've gone to the lighter-looking wheat items," she said. "That might be better for children who haven't been exposed to whole grain-rich food." The district doesn't plan to reverse any of its progress, Dodson says. That's probably reflective of most districts that have taken steps to meet the standards — they will continue to, Joyce said. And she has a suggestion for anyone who's still skeptical of current school nutrition standards, regardless of which end the political spectrum they may stand. "If you have a problem with school nutrition, go have lunch," Joyce said. "Go see what's in the cafeteria yourself."